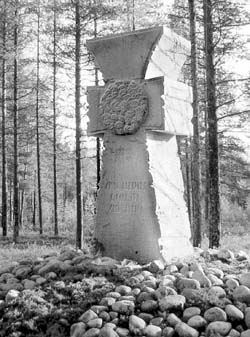 On Oct. 27 and Nov. 1-4, 1937, at a tract of land in southern Karelia known as Sandarmokh, Captain Mikhail Matveev executed 1,111 inmates of the Solovky [Rus. Solovki] Special-Purpose Forced Labor Camp (SLON), including 290 Ukrainians. One hundred and thirty-four of the latter, “Ukrainian bourgeois nationalists,” were shot on Nov. 3. The Soviet era’s largest mass purge of elements “incapable of building communism” was theoretically corroborated by the new NKVD chief Nikolai Yezhov and approved, with some changes, by Stalin himself. It began in compliance with NKVD order no. 00447 of Aug. 5, 1937, and was supposed to last for four months. In fact, it ended on Nov. 15, 1938, in accordance with a resolution passed by the Politburo of the Central Committee of the All-Union Communist Party (Bolshevik) (CC AUCP[b]). The purge had lasted for about 15 months. In the course of the campaign, a total of 681,692 people were sentenced to death for political reasons, of which 631,897 were convicted by extrajudicial tribunals called troikas. According to the Moscow branch of the Memorial Society, 1,725,000 people were arrested and 815,000 shot. According to official data, in Ukraine 15,717 people were arrested in 1936, 159,573 in 1937, and 108,006 in 1938. It is wrong to assert that the Great Terror was only aimed at Communist Party cadres: the number of communists arrested in 1937- 1938 only totaled between 110,000 and 113,000. “The year 1937 saw huge-scale repressions that affected all regions and all social strata without exception — from the country’s topmost leadership to peasants and workers who were totally removed from politics,” state the Theses of the International Memorial Society. A total of two million people were destroyed during the purge. Already on July 2, 1937, to the accompaniment of bravura marches in honor of “the Stalinist Constitution, the world’s most democratic,” the Politburo approved Protocol P51/94 “On Anti-Soviet Elements,” which urged secretaries of regional and republican party organizations and NKVD officers to draw up lists of all “kulaks and criminals” who had returned from prisons and internal exile, so that the most hostile of them could be arrested and executed by administrative decisions of troikas and the rest deported to locations indicated by the NKVD. “The CC AUCP(b) suggests that the composition of troikas as well as the number of individuals subject to execution as well as those subject to deportation be submitted to the CC within five days,” the document states. Every republic, region, and district was assigned repression quotas in two categories: 1 — execution, 2 — imprisonment, with a ratio of 3: 1. This touched off a wave of local reports on fulfilling the quotas, socialist competition for exceeding them, requests to increase the quotas, especially in Category 1, and proposals for “counter-plans.” For example, Izrail Leplevsky, the People’s Commissar of Internal Affairs of the Ukrainian SSR, requested an increase in the quotas three times — on Sept. 5 and 29 and Dec. 11, 1937. After he was dismissed (and executed) in January 1938, the newly-appointed acting people’s commissar Oleksandr Uspensky made a similar request on two occasions — on Feb. 17 and in May 1938. Troikas were authorized to deal with all categories of the population. The repressions engulfed not only “kulaks and criminals” but also “counterrevolutionaries” of all hues, “insurgents,” “churchmen,” “Trotskyites,” “saboteurs,” “wreckers,” and “nationalists.” Prison camps also conducted purges in compliance with the above-mentioned resolution. For instance, Ivan Apeter, chief of the Solovky Special-Purpose Forced Labor Camps, was ordered to draw up an execution list of 1,825 inmates. One group (507 prisoners) was shot near Leningrad on Dec. 8, 1937, and another (200 or 198) was killed in Solovky on Feb. 17, 1938. It was not until 1997 that the fate of 1,116 prisoners, the so-called “Solovky transport,” became a matter of public knowledge: 1,111 prisoners, including 290 Ukrainians, were shot in Sandarmokh. The list of the “Ukrainian bourgeois nationalists” executed on Nov. 3 includes the Neoclassicist poet Professor Mykola Zerov; the founder of the Berezil Theater Les Kurbas; the playwright Mykola Kulish; the historians: Academician Matvii Yavorsky, professors Volodymyr Chekhovsky and Serhii Hrushevsky; the scholars Stepan Rudnytsky, Mykola Pavlushkov, Vasyl Volkov, and Petro Bovsunivsky; the founder of the USSR’s Hydrometeorological Service Professor Oleksii Vangenheim (of Dutch origin); Soviet Ukraine’s Minister of Finances Mykhailo Poloz; the former education minister of the UNR Anton Krushelnytsky and his sons Ostap and Bohdan (his daughter Volodymyra was shot near Leningrad and two other sons Ivan and Taras were executed in Kyiv in December 1934); and the writers Valerian Pidmohylny, Pavlo Fylypovych, Valerian Polishchuk, Hryhorii Epik, Myroslav Irchan, Marko Vorony, Mykhailo Kozoris, Oleksa Slisarenko, and Mykhailo Yalovy. These were individuals who could have created priceless spiritual treasures that could have placed us, Ukrainians, on a par with other civilized nations. The very existence of such people in a society makes it qualitatively different. But the shots of the poorly-educated but well-trained executioner Captain Matveev, who was carrying out the will of an alien and deeply hostile communist government, changed the course of our history. Admittedly, a nation that has lost two to three percent of its most active members is considered vanquished. But we, Ukrainians, lost one-third of our most active population in the 1930s and 1940s through famine, repressions, deportations, and wars. We still have not recovered from this blow. The late James Mace defined the current stage of Ukraine’s history as post-genocidal. Even the proclamation of Ukrainian independence failed to reverse the intellectual and moral decline of Ukrainian society and put a halt to further Russification. All our troubles stem from the satanic culling that physically destroyed the best part of the Ukrainian nation. Among those whose last known address was Sandarmokh were the famous Russian lawyer Aleksandr Bobrishchev-Pushkin (he defended Beilis and Purishkevich), the Moscow-based literary specialist Nikolai Durnovo; the father of Udmurtian literature Kuzebai Gerd; Belarusian minister Flegont Volynets; the Tatar civic figure Izmail Firdevs; the head of the Moscow gypsy camp Gogo Stanesko; the Georgian princes Nikolai Eristov and Yasse Andronnikov; the Catholic Administrator of Georgia Shio Batmalashvili; Professor Pinkhus Gluzman (a Jew), a specialist on the history of the AUCP(b); the Circassian writer Prince Kholid Abukov; Korean activist Tai Do; the Orthodox bishops Aleksii of Voronezh, Damian of Kursk, Nikolai of Tambov, and Piotr of Samara; the leader of the Soviet Baptists Vasilii Kolesnikov; and Rev. Peter Veigel whom the Vatican sent to verify the information about the persecution of believers in the USSR. Numb with cold (may the end come swiftly), dressed only in underwear, taking his last steps, and recalling the words of a prayer with his deadened brain, he finally saw that he had found himself in the Kingdom of Satan, the Evil Empire. The convict was made to kneel down, and Captain Matveev shot him with his revolver in the back of his head. He killed off other prisoners by beating them with an iron stave. The attendants would throw the victim into a pit. The corpses were sprinkled with lime and covered with earth. Today they cannot be identified. This was how the “friendship of peoples” was cemented on the eve of the 20th anniversary of the “Great October Socialist Revolution,” which the communists still celebrate. In the Black Book of Communism, which was also published in Russia in 1999 with an introduction by former CC CPSU Politburo member Aleksandr Yakovlev, the authors, a group of international scholars, reckoned that communism took a worldwide toll of 95 million (p. 37). “But who will count the blood and tears?” All the nations that had the misfortune of ending up in the communist experiment had their share of suffering. Whoever considers himself a communist is morally responsible for the innumerable crimes of communism. In the 1930s Sandarmokh was the “usual site of shootings” in southern Karelia. It was located with the help of documents and identified on July 1, 1997, by activists from Karelia and the St. Petersburg branch of Memorial Yurii Dmitriev, Veniamin Ioffe, and Irina Reznokiva-Flige. On Oct. 27, 1997, the anniversary of the beginning of the executions, the first remembrance service and public rally was held at Sandarmokh. A monument was erected there, which bears the inscription “People, do not kill each other!” The St. Petersburg branch of Memorial brought a stone from Solovky. There are large Polish and Russian crosses and a Muslim memorial sign. In the woods there are hundreds of Karelian memorial signs — stakes with plaques. About 9,000 executed people are buried in several hundred pits. A large monument, a granite Cossack cross “To the Slain Sons of Ukraine” (by Mykola Malyshko and Nazar Bilyk), was erected in Sandarmokh in 2004 on the initiative of the US citizen Veniamin Trokhymenko (whose father, a well-known linguist, was shot here on Nov. 4) and through the efforts of the world Ukrainian community, above all, the Kalyna Ukrainian Cultural Society of Karelia headed by the prominent altruistic activist Larysa Skrypnykova. A circle on the cross features the profiles of these flowers of the Ukrainian nation. Sandarmokh is only one of many well-known episodes of the Great Terror. How many are still unknown? The president urged the Cabinet of Ministers to draw up a plan of measures within a month. So far, nothing has been heard about such a plan. Yet the Ukrainian Institute of National Memory and the All-Ukrainian Vasyl Stus Memorial Society have fulfilled one item of the decree: they organized the first government-level expedition to Sandarmokh and the Solovets Islands on Aug. 2-11, 2007. Until recently, such actions were organized by civic bodies supported in the past few years by Our Ukraine.